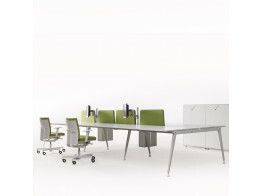 Office Bench Desks are designed for open plan offices providing flexible workstation solutions. Good office furniture desk systems provide team focused desk solutions, encouraging open dialogue and collaborative working – a positive departure from the isolated cubicles of the past, permanent desk dividers and even private offices. Back-to-back office bench desk systems offer flexibility, with a range of modules starting from a standard double bench desks, comprising of two desks back-to-back for two users, commonly known as a starter bench desk unit. 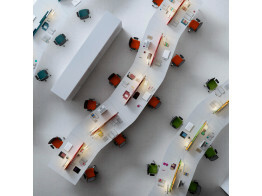 Many bench desks are modular, allowing the creation of larger linear office bench systems for the open plan work place. For every double bench desk extension unit added to a starter bench desk, the run of desking would be able to accommodate two additional staff members. Desktop sizes can start from as small as 1000mm wide by 600mm deep, with larger sizes available going up in increments of 200mm. Desktops can be specified in a range of finishes from cost effective MFC options, linolium to veneers, or even solid wood tops. We at Après Furniture offer businesses high quality office bench desks that provide a range of designs and advanced cable management options. 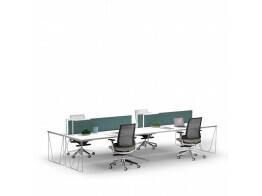 We can assist you when it comes to the deciding on a bench system for your working environment and office culture. Whether you are looking for one bench or a bench desk system for an entire office floor, we can guide you at every stage of the project. We can also help you with providing accurate office space planning for your desking; designing configurations to meet the required head count or to maximise seating for now and any future forecasts. Our modern office bench desking ranges will allow you to create professional modern working environments that support your staff ergonomically, optimise their working environment, and consequently improve their work rate efficiency, as well as morale. Most of our bench desks offer complementary personal desking side storage options and accessories. These include creative space saving personal storage options, desk dividers, easy power and data access. Office Bench Desking is economical when compared to single office desks as they use less framework and legs, thereby reducing the cost per employee desk. Our modern office bench desking ranges will allow you to create professional modern working environments that support your staff ergonomically, optimise their working environment, and consequently improve their work rate efficiency, as well as morale. Most of our bench desks offer complementary personal desking side storage options and accessories. These include creative space saving personal storage options, desk dividers, easy power and data access. Office Bench Desking is economical when compared to single office desks as they use less framework and legs, thereby reducing the cost per employee desk. 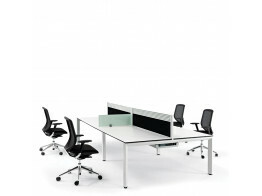 M10 Office Bench Desk are a modular desking system that can be organised in a snake configuration. Pigreco Office Bench Desks is an innovative easy to expand on office desking range. 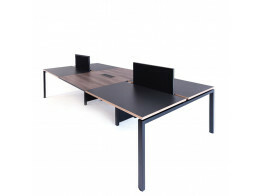 Pailo Desking systems featuring single and back to back benches and tables for relaxed working. Vital Plus ST Bench Desking with warm laminated steel frame can do wonders for the office environment. Let's Work Desking is a functional office workstation solution for all aspects in the workplace. Oblique Visual Bench Desks is a highly flexible workstation solution for fast moving open plan office. Thinking Quietly Bench Desking is an innovative solid wooden office desk solution. Goalpost Office Desking with telescopic beam system provide modern flexible workstations.